If you're just starting your civil engineering career and need to shore up your resume's infrastructure, check out this entry-level resume sample. To be a successful candidate for civil engineering jobs, resume expert Kim Isaacs says it helps to have a comprehensive resume. 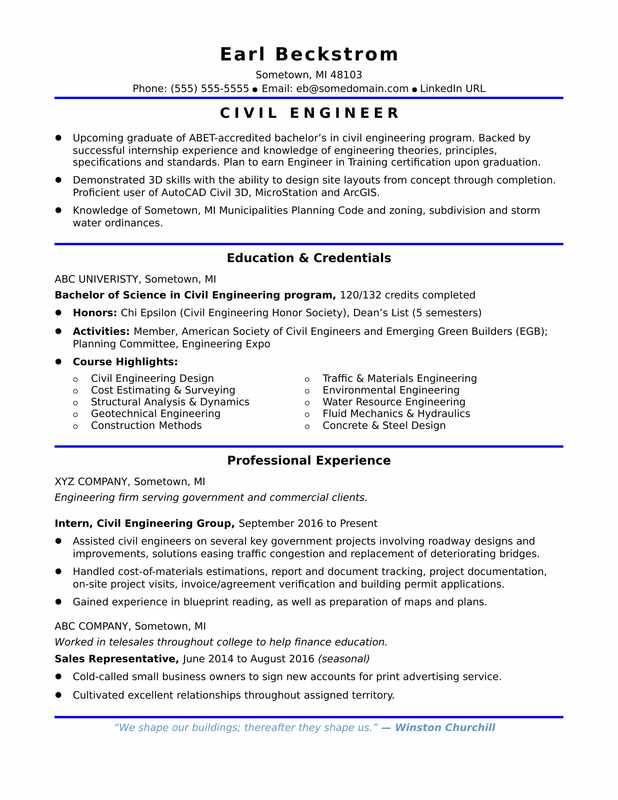 If you're just starting your civil engineering career but need to shore up your resume's infrastructure, check out this resume sample for an entry-level civil engineer that Isaacs created below. You can also download the entry-level civil engineer resume template in Word. Jobs for civil engineers are projected to grow by 11% (or 32,200 jobs) from 2016 through 2026, which is faster than average, according to the Bureau of Labor Statistics (BLS). You'll find the highest level of employment for this job in the following states: California, Texas, Florida, New York, and Pennsylvania; and in the following metropolitan areas: New York City, Houston, Los Angeles, Chicago, and Atlanta. As a civil engineer, you can expect to earn a median wage of $84,770 per year, or $40.75 per hour, according to the BLS. Additionally, you can learn about engineering careers on Monster. Upcoming graduate of ABET-accredited bachelor’s in civil engineering program. Backed by successful internship experience and knowledge of engineering theories, principles, specifications and standards. Plan to earn Engineer in Training certification upon graduation. Demonstrated 3D skills with the ability to design site layouts from concept through completion. Proficient user of AutoCAD Civil 3D, MicroStation and ArcGIS. Knowledge of Sometown, MI Municipalities Planning Code and zoning, subdivision and storm water ordinances. Engineering firm serving government and commercial clients. Assisted civil engineers on several key government projects involving roadway designs and improvements, solutions easing traffic congestion and replacement of deteriorating bridges. Handled cost-of-materials estimations, report and document tracking, project documentation, on-site project visits, invoice/agreement verification and building permit applications. Gained experience in blueprint reading, as well as preparation of maps and plans. Worked in telesales throughout college to help finance education. Cold-called small business owners to sign new accounts for ABC Company’s print advertising service. Cultivated excellent relationships throughout assigned territory. Though a resume isn't technically a structure, there are a lot of parts that go into making it hold up under pressure. Not sure yours passes the stress test? Get a free resume evaluation today from the experts at Monster's Resume Writing Service. You'll get detailed feedback in two business days, including a review of your resume's appearance and content, and a prediction of a recruiter's first impression. It's a quick and easy way to make sure you're in strong shape for a job search.